These 14 gram Tri-Color Ace/King Clay Chips are 39 mm diameter casino-sized chips and are designed with an authentic soft clay look and texture. They are crafted of a solid clay-like substance, with an inconspicuous metal insert. These exclusive new chips were created by the use of the latest technology to produce a heavy chip with the real sound and feel of an actual Casino chip. When our engineers produced these chips, we couldn't believe they had an insert - they sound that great! With a fine assortment of tri-tone colors, this exclusive chip line looks great too! Few chips on the market today can boast 3 colors and we are proud to offer these colorful and one-of-a-kind chips. With card suits decorating the outer rim of the chip in either black or white, and alternating Ace/King cards, these chips are available in your choice of 5 different color combinations. 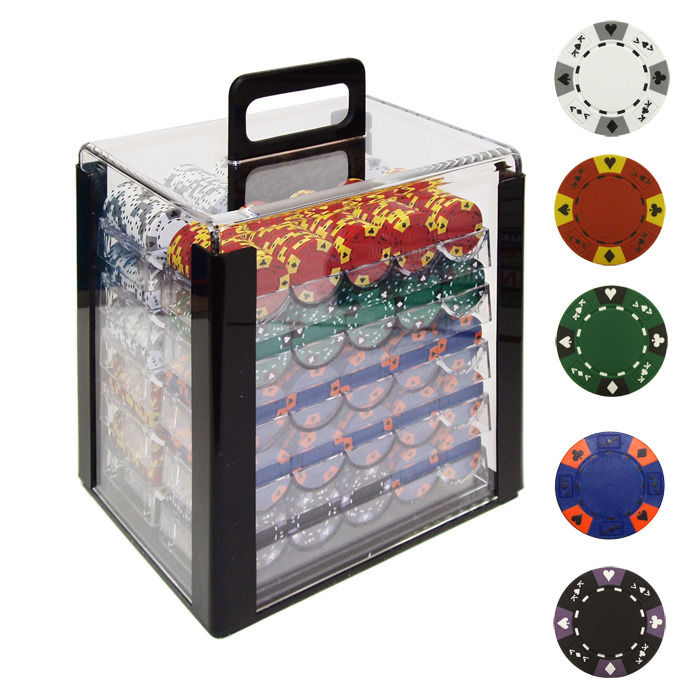 Used in casinos all over the world, this handy 1000 chip carrying case makes it easy to transport chips all over your casino or gaming room, and allows for fast and easy chip access during those crucial gaming moments.